After a countless amount of live game viewings spanning many cities and many different teams, it is finally time to bring out the Alliance Player Rankings for the 2001 born players. This year for the Alliance features a lot of top end talent on the ice to go along with an Alliance team that was ranked #4 in the inaugural OHL Cup Rankings. There were two different areas of this list that were fairly difficult. Firstly, it was narrowing down my original list of about 45 players down to the 25 that compile this list. That was a task that took lots of debate and overview to finally come to a decision. Secondly, it was trying to arrange players in slot where there is such a miniscule difference between some of these players. So the 25 have now been slotted and we will start with the players landing in the 16-25 range. There will not be any “on the bubble” list but it is probably inevitable that next month when the 2nd list makes an appearance that some new faces will be there. 25. Liam Vanloon (London Jr. Knights) – Vanloon is a high energy player who continually finds his way to the puck. At All-Star weekend, Vanloon was a standout amongst the forwards and found his way onto the score sheet. When people talk about the overflowing amount of talent on the Jr. Knights squad, Vanloon should be in the conversation with the rest. 24. Ben Sheppard (Hamilton Huskies) – A personal favourite from the 2001 class, Sheppard combines physical play with a great point shot to make himself a dual threat in the Huskies lineup. His hockey IQ ranks among the top of the league and when he return to the lineup, look for the Huskies to be a tough matchup down the stretch. 23. Gavin Wood (Waterloo Wolves) – When we talk about hockey IQ with Sheppard, Wood is right there as well. Mistakes are rare in his game and seems to always be thinking two moves ahead. Very strong on his stick with a shot made for a powerplay unit, Gavin could follow in the footsteps of older brother Kyle and become a steady presence on the back end. 22. Jacob Bloomfield (Brantford 99ers) – A player who showed strong skills in bantam viewings, Bloomfield has continued to be the first option for the 99ers on offense. Still small in size, it doesn’t stop him from playing a physical style mixed in with incredible speed. Added strength will help both physically and with his puck control, but Bloomfield has the raw skills to further succeed. 21. Mark Woolley (Elgin-Middlesex Chiefs) – One of the hardest hitters in the Alliance this season, Woolley has been relied on by the Chiefs for massive minutes this season. A general on the ice who likes to bring the puck into the offensive zone, Woolley also has one of the best point shots in the league. Whether he’s winding up or releasing a quick snap shot, he finds the back of the net quite often. 20 – Jeffery Burridge (London Jr. Knights) – Many times players with his size end up playing a physical game, but that is not what Burridge plays. He has speed that many his size don’t possess so he is able to bring the puck up the wing and release a quick, accurate shot. Burridge is one of the more underrated players in the league in my opinion and has been a solid source of offense for a high powered London team. 19. Brayden Krieger (Waterloo Wolves) – Krieger has quietly put together one of the quieter seasons in the Alliance this year. A speedy forward who always seems to be finding the scoresheet, Krieger has quickly become the number two offensive option for the Wolves. Krieger is a player who has tremendous upside and is similar to former Wolves forward Spencer Kersten in my opinion. 18. Aaron Shaw (Windsor Jr. Spitfires) – Shaw is the lone member of the Windsor squad to make this list and he has more than earned it. A speedy player who has shown great versatility this season, Shaw is very similar to Krieger in that he has quietly been lighting up the scoresheet. Shaw has been entrusted to play in almost every situation, which has led to Shaw leading the Alliance with three shorthanded goals. 17. Cole Schwindt (Kitchener Jr. Rangers) – Schwindt may have been one of the most underappreciated players in his bantam season due to the struggles of Kitchener. This season, Schwindt has gelled with Cole MacKay and Justin McCombs to put Kitchener near the top of the standings. Schwindt has smooth stick handling and has length in his game that gives him the edge when going around defenders. Schwindt’s attack mentality makes him a dangerous offensive threat at all times. 16. Jagger O’Toole (Cambridge Hawks) – O’Toole has been a work horse for the Hawks as injuries have limited the team to just four defenseman for a big chunk of the season. O’Toole combines size and skill as he consistently creates opportunities up front while also being a huge obstacle for forwards coming across the blue line. With the team getting healthier, O’Toole may be able to take his game to the next level with fresher legs on the ice. 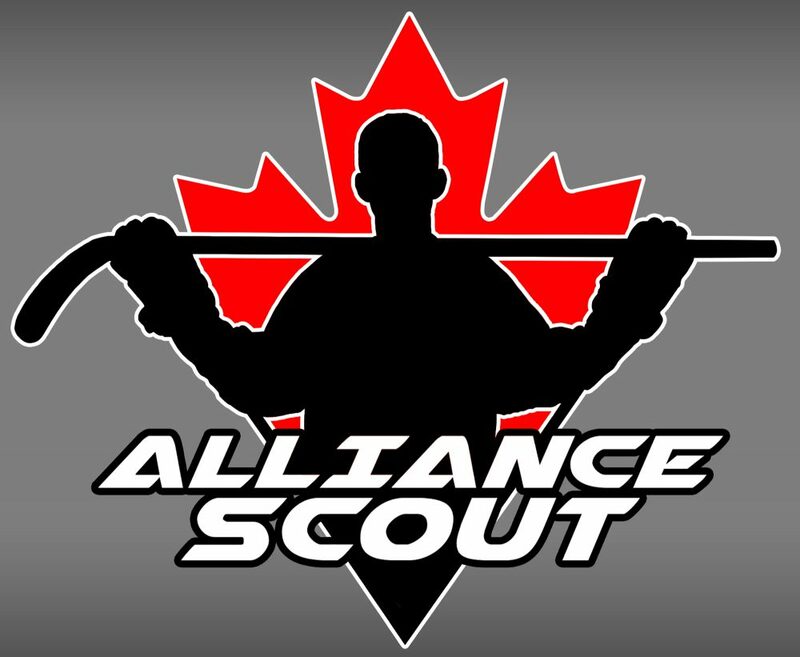 This entry was posted in Alliance Rankings, Alliance Scout, Brantford 99ers, Cambridge Hawks, Elgin-Middlesex Chiefs, Hamilton Huskies, Kitchener Jr. Rangers, London Jr. Knights, ohl draft, Waterloo Wolves, Windsor Jr. Spitfires and tagged 2017 ohl draft, aaron shaw, Alliance Player Rankings, Alliance Scout Top 25, ben sheppard, Brantford 99ers, brayden krieger, cambridge hawks, cole schwindt, elgin-middlesex chiefs, gavin wood, hamilton huskies, jacob bloomfield, jagger o'toole, Jeffery Burridge, Kitchener Jr. Rangers, Kyle Wood, liam vanloon, london jr. knights, mark woolley, ohl draft, spencer kersten, waterloo wolves, windsor jr. spitfires by Dave Coulson. Bookmark the permalink.